90. Terme di Marco Crasso Frugi, Oncino, Oplontis, Torre Annunziata. Excavated 1831-1834, 1940s and 1960. The Baths of Marcus Crassus Frugi were found in the years 1831-1834 in Torre Annunziata, in the area of Oncino, during construction of the spa establishment of General Vito Nunziante. They are located under today's Terme Vesuviane at the Rampa Nunziante. According to Wikipedia Italia the Baths of the consul Marcus Crassus Frugi date back to 64 AD and the ruins are still visible along the via Litoranea Marconi and within the current Terme Vesuviane, the spa complex founded by General Vito Nunziante in 1831 on the site of the ancient baths. 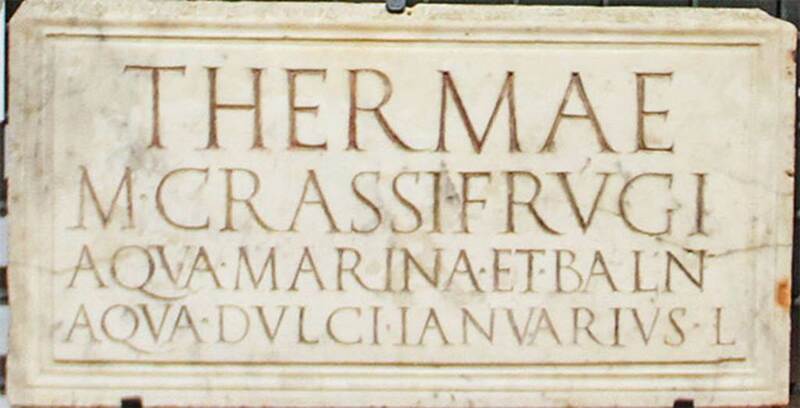 Maiuri identifies the baths structure on the promontory of Oncino at Oplontis, with underground reservoirs for seawater, as being linked to Marcus Crassus Frugi and the inscription on the marble plaque found reused in Pompeii. See Maiuri, A., 1959. Note di topografia pompeiana: Rendiconti Accademia Archeol. Lett. B. Arti di Napoli, 34, pp. 81ff. According to Fagan, the nature and function of this structure is most unclear. See Fagan G. G., Bathing in Public in the Roman World, p.63 note 76. According to Fergola, Liberatore, however, identifies them as the Terme Nonie, that is, belonging to Lucius Nonius Florus. This name appears on the edge of a terracotta basin that was part of the furnishings of the baths, and which also was decorated with vegetal forms and galloping horses. See Liberatore, R., 1835. Delle nuove ed antiche terme di Torre Annunciata: articolo inserito nel fascicolo XII degli Annali Civili. Napoli, p. 43. Casale A., Bianco A., Primo contributo alla topografia del suburbio pompeiano: Supplemento al n. 15 di ANTIQUA ottobre-dicembre 1979, 120, p. 47, fig. 21. Corpus Inscriptionum Latinarum Vol. X part 1, 1883. Berlin: Reimer, p. 122, CIL X 1063. D'Arms J.H., 1970. Romans on the Bay of Naples, Cambridge (Mass. ), pp. 214-215. Della Corte, M., 1965. Case ed Abitanti di Pompei. Napoli: Fausto Fiorentino, pp. 29-30. Fagan G. G., 1999. Bathing in Public in the Roman World. Univ of Michigan Press. p.62. Keppie, L., 1991. Understanding Roman Inscriptions. Baltimore: John Hopkins U.P. p. 57. Kockel V., 1985. Funde und Forschungen in den Vesuvstädten 1: Archäologischer Anzeiger, Heft 3. 1985, p. 547. Maiuri, A., 1959. Note di topografia pompeiana: Rendiconti Accademia Archeol. Lett. B. Arti di Napoli, 34, pp. 73ff. Malandrino C., 1977. Oplontis, Napoli, pp. 41ff. and figs. 9-11. Terme di Marco Crasso Frugi. Torre Annunziata, Location plan. Plaque found reused in the niche of a shrine in the Villa of Cicero at Pompeii. Now in Naples Archaeological Museum. Inventory number 3829. The hot baths of Marcus Crassus Frugi; sea water available and a bath with fresh water. The freedman Januarius. See Keppie, L., 1991. Understanding Roman Inscriptions. Baltimore: John Hopkins U.P. p. 57. According to Fagan, this plaque was found in 1749 near the Herculaneum Gate. He states that the location of these baths is not known, but the owner has frequently been identified with M Crassus Frugi who was consul in AD46 who, Pliny the Elder reports, owned hot springs that came from the sea itself, in the Bay of Baiae. The identification, however, is far from certain, and, since the baths may have run in the family for some time before Pliny’s Crassus, their construction may date back to the reign of Tiberius. In fact three M. Crassus Frugi, the consuls of AD 14, 27 and 64, are candidates for the construction and/or ownership of this building. The inscription draws a clear distinction between two types of bathing, one in sea water and one in fresh water, which would require either separate structures close at hand or at least distinct section in a single building. Both possibilities are attested elsewhere. He quotes Maiuri as identifying these baths as being a structure on the promontory of Oncino at Oplontis, with underground reservoirs for seawater. Fagan, however, regards the nature and function of this structure as most unclear. See Fagan G. G., 1999. Bathing in Public in the Roman World. Univ of Michigan Press. p.62 and notes 74-6. See Maiuri, A., 1959. Note di topografia pompeiana: Rendiconti Accademia Archeol. Lett. B. Arti di Napoli, 34, pp. 73ff. Plaque as described in CIL X 1063. See Corpus Inscriptionum Latinarum Vol. X part 1, 1883. Berlin: Reimer, p. 122, CIL X 1063. Terme di Marco Crasso Frugi. Torre Annunziata. Plan by Raffaele Liberatore dated 1 Dicembre 1834. Pianta delle Antiche Fabbriche incontrati nella costruzione della strada che conduce allo Stabilimento dei Bagni di Acqua Termo-Minerale-Vesuviana-Nunzianti. Terme di Marco Crasso Frugi. Torre Annunziata. 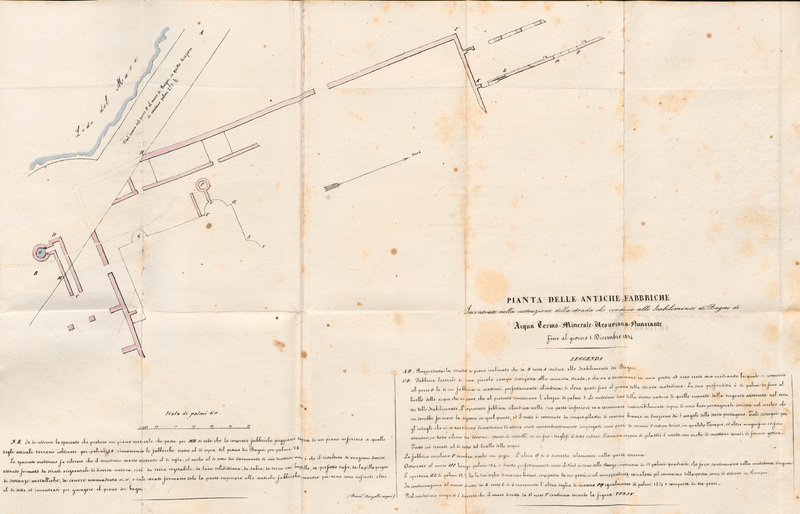 After I dicembre 1834 plan by Raffaele Liberatore. 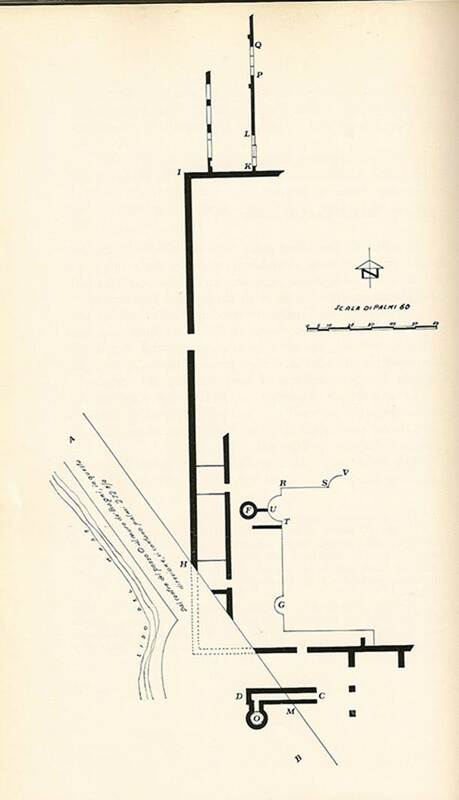 Plan of the old buildings encountered in the construction of the road that leads to the thermal mineral water baths of Vesuviana-Nunziante. C to D: A slight ramp under the above-mentioned road, ending in an arched door to m-n connecting with a brick made well shaft (O), perfectly cylindrical rising almost up to the plane of the road itself. Its depth is 30 palms (7.91m) until the water level which at present maintains a depth of 5 palms (1.32m). These are of the same nature as those derived from existing source in the centre of the establishment. The cylindrical brickwork in its lower portion terminates on a pentagonal base supported by five pillars of white marble in the 5 corners of the Pentagon. These pillars seem to have been reused from a Doric temple or other magnificent building, there being low relief rosettes, heads of calves on the cornices. Each pair of pillars joined with brick arches almost Gothic in form. All this was found below the water level. H-I: This wall was 184 palms (48.5m) long, and headed perfectly to the north with attached rooms, each of 18 palms (4.75m) square, which may continue in the same direction. K-L: This opening is 13.5 palms (3.56m) with a threshold of white marble, composed of three pieces and with the corresponding gutter to the outside of the door as seen in Pompeii. P-Q: Another marble threshold also 13.5 palms (3.56m) and made of three pieces. T-U-R-S-V: At the same time it was discovered that the wall from G to T also continues according to the outlined T-U-R-S-V.
M-H: A vertical cross-section along this line shows that the lower floor is 58 palms (15.3m) below existing farmland, and the remains of the baths level are 28 palms (7.38m) below existing farmland. The same section pointed out that the existing hard rock above, and also below the tenements in question was not the result of several eruptions, being formed of horizontal layers of different natures, that is, from the ground with lapilli, perfect tufa, lapilli mixed with metallic substances, packed ash etc. etc., and these layers formed only the upper part to the old construction, and there were infinite others below, encountered in reaching the floor of the baths. See Liberatore, R., 1835. Delle nuove ed antiche terme di Torre Annunciata: articolo inserito nel fascicolo XII degli Annali Civili. Napoli, Tav. The construction work of the spa was on the remains of the previous baths of Roman origin. Six rooms were found, some pools, 30 ornate small pedestals/columns and another 48 small pedestals/columns. All the rooms discovered had gaps under the floor and in the walls for the passage of hot air. Also discovered were tunnels and caves in the water system of the Romans, the only archaeological evidence of the geohydrology. The finding of a hot spring [in the 1830s] prompted General Nunziante to build a thermal spa above that is still operating. 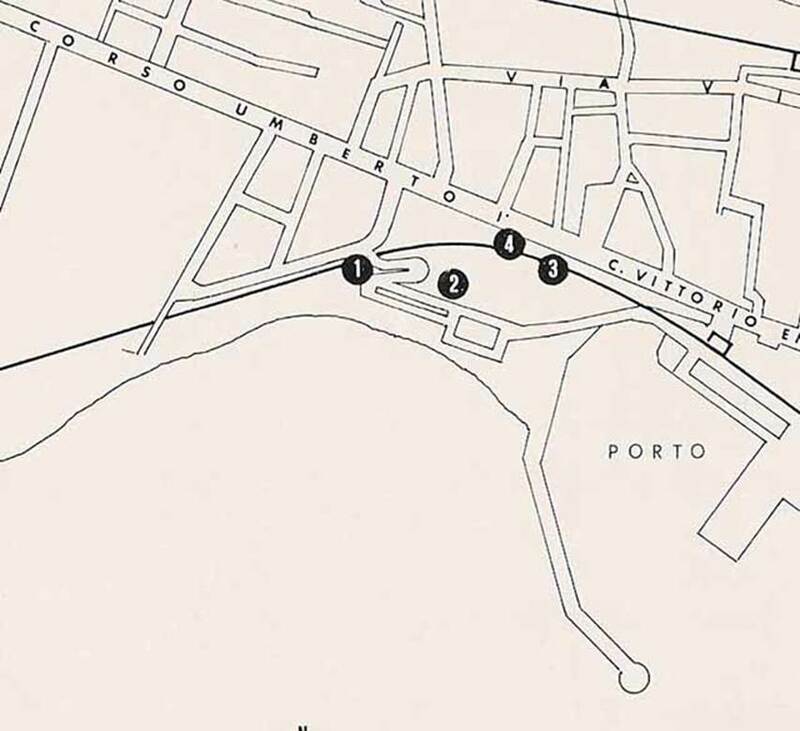 The success of the spa led to the building of the Naples to Portici railway, the first Italian railway network, enabling people to get to the spa more easily. The construction work of the spa, to which was added that of the railway, resulted in there being little evidence remaining of the ancient baths. See Malandrino C., 1977. Oplontis. Napoli: Loffredo editore, pp. 41ff, fig. 10. See Casale A., Bianco A., Primo contributo alla topografia del suburbio pompeiano: Supplemento al n. 15 di ANTIQUA ottobre-dicembre 1979, n. 120, p. 47, fig. 21. Terme di Marco Crasso Frugi. Capo Oncino. 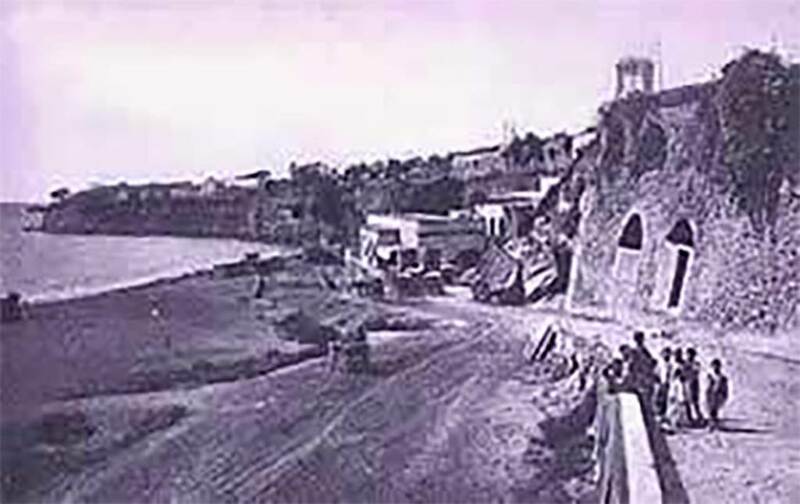 Construction of the Rampa Nunziata in the 1940s. Pictured left, the construction of the spa was above the remains of the previous baths of Roman origin. Terme di Marco Crasso Frugi. Torre Annunziata. Underground water passage or reservoir. According to Malandrino in May 1960, during works to extend and transform the existing thermal baths, a casual discovery (or rediscovery) was made. Several tunnels of ancient fabric were discovered which served to carry the water to the ancient baths. Only two were explored but apparently there were others. More recent fragments of pottery and lamps were found, which may date from the 1831-4 excavations. Probably the tunnels were originally explored and then walled up at that date. This gave rise to the suggestion that this was a rediscovery, rather than a discovery, in 1960. See Malandrino C., 1977. Oplontis. Napoli: Loffredo Editore, pp. 46f. According to Marasco, on 8 May 1960, during work undertaken to expand and renovate the mud baths of the Terme Nunziante, by this time rechristened the Terme Vesuviane, an unexpected hole appeared in the solid wall of ash. Workers tore down the ash barrier to reveal a north-south tunnel lying perpendicular to the ash bank they were working on (3.23). It was a channel of Roman construction and therefore part of the ancient bath complex identified in the previous century as belonging to Marcus Crassius Frugi. The tunnel (1.8 m high × 1 m wide) continued north-south for about 5.5 m. The evidence pointed to a varying water level that reached 25 cm at its highest point, and water in the tunnel was subject to tidal ebb and flow. The water was muddy, suggesting that the Romans used it for curative mud baths. Inside the tunnel two large holes of indeterminate depth were thought to be wellsprings used to convey the underlying mineral waters directly to the mud bath. Following this discovery it was decided to sound out the entire wall to look for other cavities or tunnels, with the hoped-for result: A second tunnel was found 2.95 m from the first one (3.24). The initial section of the second tunnel extended north-south for about 20 m before turning west for another 5 m and then flowing into a well of unknown depth. The tunnel was about 1.55 m high and on average 1.65 m wide, with walls free from any type of plaster but covered with a layer of saltpetre. 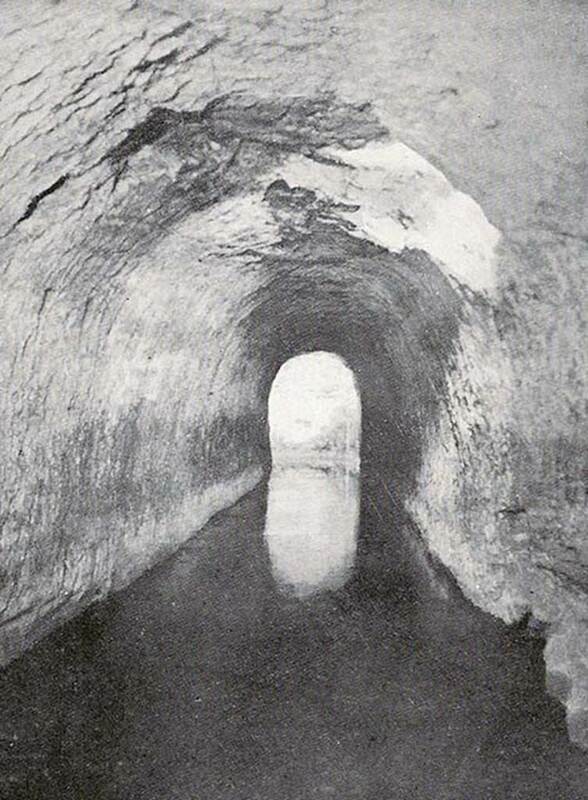 The tunnel floor was somewhat muddy with water about 25–30 cm deep. This water also seemed subject to the movement of the tides, and this tunnel, contrary to the first one, seemed always to have water in it. Sulphur dioxide rising from the bottom makes the water look as if it is continuously boiling and also made it impossible to create measured drawings because there was very little oxygen in the tunnel. In all probability, the function of this second tunnel must have been associated with the conveying and continuous supplying of the sulphurous waters to the bath complex. During the exploration and cleaning of these two tunnels, various types of finds of a more recent date than that assigned to the tunnels themselves came to light—some oil lamps as well as other objects that were presumably left in place during the 1834 excavations by the company of General Vito Nunziante. It is therefore clear that the two tunnels had been discovered and examined by the first explorers of these structures, but for reasons unknown they were then walled up again. FIG. 3.25 Amedeo Maiuri visits the Terme Nunziante as soon as he hears of the sensational discovery, May 1960. Photo © V. Marasco. FIG. 3.26 Franz Formisano shows the discovery to Professor Maiuri. Seated at left: Luigi Manzo, manager of the Terme Nunziante. Photo © V. Marasco. FIG. 3.27 Luigi Manzo discusses the discovery with Professor Maiuri with, from the left, Franz Formisano, Monsignor Salvatore Farro, and Dr. Franco Pierro. Photo © V. Marasco. FIG. 3.28 Amedeo Maiuri converses with the pioneers of the Oplontis discovery. Photo © V. Marasco.